As the graphics above make it clear enough, this decipherment is pretty straightforward, much to my relief, considering how so many Linear A inscriptions are such tough nuts to crack. This chart speaks for itself. Notice that at least 4 of these dry units of measurement in Linear A have counterparts in Linear A.
Tablet, Malia Palace MA/P Hi 02 in so-called Cretan hieroglyphs, which are not hieroglyphs at all, but rather ideograms and logograms, is highly intriguing. Actually, this tablet is partially decipherable. The front side definitely deals with the produce of olive trees, i.e. olive oil and also with wheat crops. If anyone is in any doubt over the meaning of the logogram 5. TE, which looks exactly like the Linear A and Linear B syllabogram TE, this doubt can easily be swept away by mere comparison with the logogram/ideogram for “wheat” in several ancient scripts, some of which are hieroglyphic, such as Egyptian, others which are cuneiform and yet others which bear no relation to either hieroglyphs or cuneiform, or for that matter, with one another, as for instance, the Harrapan and Easter Island exograms. In fact, the recurrence of an almost identical ideogram/logogram across so many ancient scripts is astonishing. It is for this reason that I am in no doubt over the interpretation of 5. TE as signifying what in the Cretan script. Next up, we have 3a. & 3b., which I interpret, and probably correctly, as signifying “ewe” and “ram” respectively. In fact, the resemblance of 3b. to a ram’s head is uncanny. What is passingly strange is this: the ram’s head figures so prominently on the second side of the tablet, being much larger than any other ideogram/logogram on the tablet. Why is this so? There simply has to be a reason. But for the time being, I am stumped. Since 3a. & 3b. Relate to sheep, it stands to reason that 6. is another type of livestock. My money is on “pig”. 7. and 9. are both vessels, 7. probably being either a wine or water flask and 9. being a spice container, as it is strikingly similar to the Linear B ideogram for the same. 8. looks like some kind of grain crop, and so I take it to be so. As for the rest of the ideograms/logograms, they are still indecipherable. ade/adu = large unit of measurement for grains, something like bales? durare = a type of grain, durum wheat? kasitero kasite/loj = boundary of...? mirutarare = sheep pen? -or- apple orchard? paja/pajai/pajare = contracted, indentured, hired? para para\ = beside, from beside, by the side of, beyond etc. pasarija = pa=sa + rija = all-encompassing, international? sato sa/ton = Hebrew unit of measurement. setamaru  = something to do with wool/spun wool? taikama taika/ma = a unit of land, something like an acre? merasasaa/merasasaja (very common) = something to do with honey/ honeycomb or honey drink? daqera = a type of vase? posa po/sa= (arch. acc.) <- poi/si=j = drink(ing), beverage -or- po/sa <- po/soj = how great, how much, of what value? supi/supu/supu2 = largest size pithos -or-   supu/h sipu/h sipu/a i0pu/a = meal tub = suropa = some kind of vase? dewa -or- wide de/#a = goddess? narepirea narepir9e/a = Rhea, goddess of the snake/ snake goddess? qesizue (plural) = wine goblets? Itinisa = female resident of Itanos? Tejare TOP Cf. Linear B Tejaro qei/aroj = place of the gods? Note that on this tablet, the word toesato/totaesato/toekito/totaekito (whichever one of these 4 alternatives it is and whatever it means) is conjectural, since I find it difficult to determine how many syllabograms there are in it. Gretchen Leonhardt, a self-styled Linear B expert, has erroneously deciphered Linear B seal BE Zg 1. As she so often does, she misinterprets syllabograms, all to often blatantly violating their phonetic values. It is clear from this seal that the last syllabogram must be either ru or ne, and  certainly not me, by any stretch of the imagination. Leonhardt is also in the habit of recasting the orthography of Linear B words she interprets to suit her own purposes. In this instance, she translates what she mistakenly takes to be the word on the VERSO to be dokame as dokema in Latinized Greek, flipping the vowels. But the second syllabogram is clearly ka, and cannot be interpreted as anything else. The problem with Ms. Leonhardt’s so-called methodology in her decipherment of any and all Linear B tablets is that she runs off on wild tangents whenever she is confronted with any word that does not meet her preconceptions. In this instance, she is desperate to cook up a meaning which appeals to her, no matter how much she has to twist the Linear B orthography. She indulges in this very practice on practically every last Linear B tablet she “deciphers”, interpreting Linear B words to suit her fancy, except in those instances where she is faced with no alternative but to accept what is staring her in the face. Then we have mewijo, which she interprets as “a kind of cumin”. Why on earth the Mycenaeans would have bothered with naming a specific kind of cumin when the standard word suffices, is completely beyond me. In fact, the alternative word she has latched onto is extremely uncommon in any ancient Greek dialect. Finally, she bizarrely interprets dipa, which is clearly the Mycenaean equivalent to the Homeric depa, as “to inspect”, another wild stretch of the imagination. Sadly, Ms. Leonhardt is much too prone to these shenanigans, which mar all too many of her decipherments. She ought to know better. This of course applies to her decipherment of Linear B seal BE Zg 1. Finally, we can also interpret the figure on this seal as representing the Horns of Consecration ubiquitous at Knossos. Moreover, it is more likely than not pre-Greek and not proto-Greek. This implies that the Mycenaean Linear A word, kuruku or kuroko, is also pre-Greek. Nothing surprising there at this point. Not only that, it flatly contradicts the translations Mrs. Leonhardt, who is not an archaeologist, brings to bear on practically every single word on this tablet, with the sole exception of those terms which are so transparent that it is impossible to interpret them otherwise than they appear. Such words are tiripode, qetorowe (quattuor in Latin) , dipa (with this word, Ms. Leonhardt’s translation flatly defies logic) and apu, in which case she is so far off the mark that it is amazing she cannot have seen how far astray she has gone in interpreting this preposition, apu, common to Mycenaean Greek, and the Arcadian, Cypriot, Lesbian & Thessalian dialects [NOTE below]. Now what is particularly striking here is the fact that the Arcadian and Cypriot dialects are practically identical, and that their parent, Arcado-Cypriot, is the dialect of the Linear C syllabary, in which once again apu appears. So how Ms. Leonhardt could possibly cook up her translation of apu as “to become bleached or white” simply baffles me beyond credulity. Why on earth would anyone fashioning pottery such as tripods, vases and cups ever want to bleach them? aikeu, which she claims is somehow “related to aikia (here Latinized) | injurious, insulting treatment...” But how on earth would insulting or injurious treatment have anything remotely to do with fashioning pottery? It is quite beyond me. which in this case is to be interpreted as “without handles”. dipa, which she, for some bizarre reason which totally escapes me and which Tselentis would find ludicrous, interprets as “to inspect, inspection”. She should make up her mind. Is this a verb or a noun? At any rate dipa is clearly the Mycenaean Greek equivalent of the Homeric depa, which everyone knows means “a cup”. Period. See . No further comment. mewijo, which she imagines is “a kind of  cumin”. In the first place, Mycenaean Greek never makes a distinction between kinds of cumin. It just has the one word, kumino, and that’s that. At any rate, why bother parsing the word down to a specific “kind of  cumin”? Additionally, it is particularly difficult to imagine why anyone would put cumin in a tripod or cup, since it would simply blow away. OK, I grant that it would probably stay put in a vase, but... mewiyo, again according to the Greek expert Tselentis, simply means “small(er)”. Mezoe she has as “barley”, but here again she is in flat contradiction with Tselentis, who has it that kirita means “barley”. I for one am not about to question the expertise of a Greek-born lexicologist. owowe, she would have us believe, “is perhaps related to damage, hurt” (italics mine). But here again, Tselentis defines owowe as “with handles”, which makes perfect sense in light of   above, anowe, which means “without handles”. These two words are clearly opposites. Anowe is after all a-privative. There are plenty of other such errors in her translation, but I simply leave these aside for our readers versed in ancient Greek to interpret as they see fit. That is a pretty good return. All terms in Minoan Linear A and in Mycenaean Linear B have been Latinized for ease of access to persons not familiar with these syllabaries. This Glossary accounts for at least 24.7 % of all intact Minoan Linear A terms. There are 45 terms deciphered with a high degree of certainty (> 75 %). These terms thus account for 37 % of all Minoan Linear A terms I have attempted to decipher. They also account for 9 % of all intact Minoan Linear A terms in Prof. John G. Younger’s Lexicon. As for eponyms and toponyms, I can only claim to have deciphered no more than 10 %, since they are so obvious and since so many of them are almost identical to their Mycenaean Linear B counterparts, in those cases where the latter exist. All of my decipherments operate on The principle of cross-correlative cohesion on the assumption that terms in Minoan Linear A vocabulary should reflect as closely and as faithfully as possible parallel terms in Mycenaean Greek vocabulary. In other words, the English translations of Minoan words in a Minoan Linear A Glossary such as this one should look as if they are English translations of Mycenaean Greek terms in a Linear B glossary. I have endeavoured to do my best to achieve this goal, but even the most rational and logical approach, such as I take, does not and cannot guarantee reciprocity between Minoan Linear A and Mycenaean Linear B terms. It is precisely for this reason that I have had to devise a scale of relative accuracy for terms in this Linear A Glossary. The best and most reliable Linear B Lexicon is that by Chris Tselentis, Athens, Greece. If you wish to receive a  copy of his Lexicon, please leave a comment in Comments, with some way for me to get in touch with you. Does this Minoan Linear A tablet refer to the Linear A word karopa3 (karopai) for a kylix? This chart lists 10 Mycenaean Linear B & Minoan Linear A words for plants & spices, with the Linear B in the left column, its Minoan Linear A in the middle column, and the English translation in the right column. It should be noted that I had to come up with a few Mycenaean Linear B words for plants on my own, because they are nowhere attested on Linear B tablets, regardless of provenance. Nevertheless, the spellings I have attributed to these words are probably correct. See the chart above. While most Mycenaean Linear B words and their Minoan Linear A words are equivalent, some are quite unalike. For instance, we have serino for celery in Mycenaean Greek and sedina in Minoan, and kitano in Mycenaean Greek versus tarawita in Minoan. There is a critical distinction to be made between Minoan Linear A kuruku, which means crocus, from which saffron is derived, and kanako, its diminutive, referring to its derivative, saffron,  which is identical in form and meaning to its Mycenaean Linear B counterpart. The ultimate termination U in Minoan Linear A always refers to larger objects. Hence, kuruku must mean “crocus” while its diminutive, kanako, means “saffron”, just as in Mycenaean Greek. This latter discovery is my own. I wish to emphasize as strongly as I can that I did not decipher these words in Minoan Linear A. Previous researchers were able to do so by the process of regressive extrapolation in most of the cases. Regressive extrapolation is the process whereby later words in a known language, in this case Mycenaean Greek, are regressively extrapolated to what philologists consider to have been their earlier equivalents in a more ancient language, in this case, the Minoan language, which is the best candidate which can be readily twinned with Mycenaean  Greek. The primary reason why all of these words can be matched up (relatively) closely in the Minoan language and in Mycenaean Greek is that they are all pre-Indo-European. In other words, Mycenaean Greek inherited most of the words you see in this chart from the Minoan language. It is understood that these words are not Greek words at all, not even in Mycenaean Greek. Almost all  of them survived into classical Greek, and are still in use in modern languages. For instance, in English, we have: cedar, celery, cypress, dittany, lily & olive oil, all of which can be traced back as far as the Minoan language (ca. 3,800 – 3,500 BCE), or some 5,800 years ago. It is to be noted, however, that I am the first philologist to have ever written out these words in both the Linear A and Linear B syllabaries. This brings the total number of Minoan Linear A words we have deciphered to at least 27. The word ti?redu on the left hand side of the top line of this Linear A tablet of unknown provenance dealing with spices may mean either “coriander” or “delivery”, but my bet is on the latter, since the word “coriander” is almost certainly pre Indo-European, and therefore probably existed in the Minoan language as well, along with the three words cited on the Linear A tablet above. I cannot for the life of me figure out what the second syllabogram on this tablet is. If there is anyone out there who can clinch it for me, please do so. 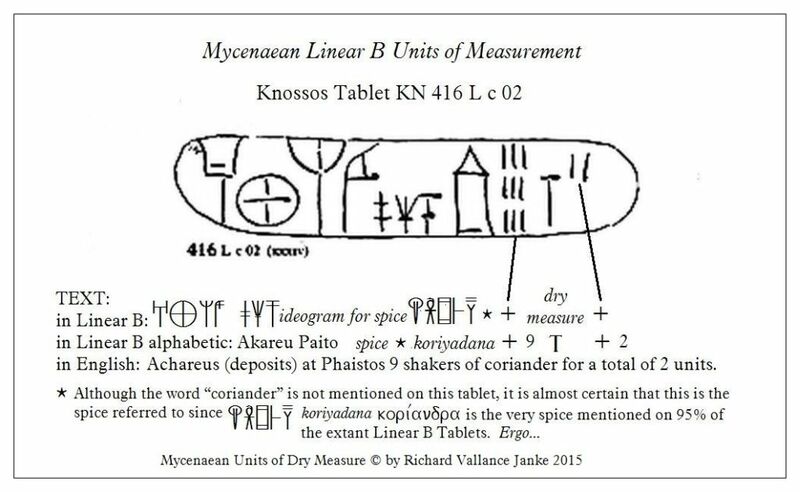 Compare the text on this tablet in Linear A with those on Linear B tablets Kn 415 Lc 01, KN 4176 L c 01 & KN 418 Lc 11 below for the reason why I prefer the translation “delivery” over “coriander”. These 3 tablets on coriander are the final 3 to be posted here. I actually posted them back in 2015, but I am reposting them with additional comments. The first tablet, KN 415 L c 01, is quite straight-forward, simply mentioning the spice shaker with 6 grams of coriander from Lykinthos. The second, KN 417 L c 01, informs us of the person who has (or owns) the spice shaker. His name is Qamos. The spice shaker contains 3 (grams) of coriander. The tablet is partially illegible. The adjective “crimson” pops up, and presumably refers to the colour of the coriander, which seems to be in powder form. The last tablet, KN 418 L c 11, is double sided. The recto side, which is again partially illegible, again deals with delivery of coriander. On the verso side, we have the adjective “purple”. I am not sure what purple is supposed to refer to, as I am unsure whether or not powderized coriander can be purple. Perhaps someone visiting our blog can enlighten me on this point. The top refers to coriander, the amount of which is equivalent to 2 X 6 grams, on the bottom we have 7 grams. The verso of the tablet appears to indicate that all of the coriander there is from Surimo. Not much to say about this one, except that it refers to Phaistos. If tablets concerning spices do not refer to a place name, they are understood to be from Knossos. Since the word -gram- did not exist in the ancient world, I have replaced it with pauron = a small amount. Well, I dare say those Minoans at Knossos and Mycenaeans certainly knew wonderful spices when they saw them. Coriander is one of the most delicious spices there are. It is fantastic on salads. I wonder what sort of dishes they served coriander with. Notice that this tablet deals with delivery of coriander (to market). They did a lot of that. Folks must have gathered in the open air markets at Knossos and Amnisos, its fabulous port, and bought the stuff by the bagfulls! (a.1) The scribes routinely omitted any word(s) or phrase(s) which they as a guild implicitly understood, since after all no-one but themselves and the palace administration would ever have to read the tablets in the first place. The regular formulae involved in the production of Linear B accounting, inventory or statistical texts of whatever length were commonly understood by all, and shared (or not, as the case may be) by all the scribes. Formulaic text, including the same Linear B stock phrases, the same logograms & the same ideograms appearing over and over again, are routine. But even that does not give us the whole picture. Some text, which would have otherwise explicitly appeared as per the criteria just mentioned, was deliberately omitted. This bothers us today, in the twenty-first century, because we expect all text to be there, right on the tablet. Sorry. No can do. The scribes merely wrote what were routine annual accounts only, and nothing more (to be summarily erased at the end of the current fiscal year and replaced by the next fiscal year’s inventories). That was their job, or as we would call it today, their job description, as demanded by the palace administration. Nothing more or less. It would never have entered the minds of the scribes or the palace administrations of any Mycenaean city, trade centre, harbour or citadel to preserve inventories beyond one fiscal year, because they never did. Routine is routine. So if we take it upon ourselves to complain that “vital information is missing”, we mislead ourselves grossly. That information was never “missing” to the personnel concerned. It is only absent to us. It is up to use to try and put ourselves into the mindset of the palace administration(s) and of the scribes, and not the other way around. Tough challenge? You bet it is. But we have no other choice. (a.2) In the case of this tablet specifically, the text which is annoyingly “missing” is that in the independent nominative variable upon which the phrase in the dative, “for barley-by-month” (kiritiwetiyai) directly depends. The “whatever” (nominative) ... “for barley-by-month” (dative) has to be something. But what? I translated the missing nominative independent variable as “ration” on the illustration of the tablet above, but this is a very rough translation. (b) What is the semantic value of the implicit independent nominative variable? If we stop even for a second and ask ourselves the really vital question, to what step or element or procedure in barley production do our average monthly statistics refer, then we are on the right track. Note that the word “average” is also absent, since it is obvious to all (us scribes) that monthly statistics for any commodity are average, after all. It is impossible for these monthly statistics for Knossos, Amnisos & Phaistos to refer to the barley crop or harvest, because that happens only once a year. The scribes all knew this, and anyway it is perfectly obvious even to us, if we just stop and consider the thing logically. So to what does the dependent dative variable refer? There are a few cogent alternatives, but here are the most likely candidates, at least to my mind. First, we have (a) ration. Fair enough. But what about (b) consumption of barley -or- (c) monthly metropolitan (market) sales of barley for the city of Knossos alone -or- (d) routine monthly trade in barley, by which I mean, international trade? All of these make sense. In fact, more than one of these alternatives may apply, depending on the site locale. Line 1 refers to the independent variable in the nominative for Knossos. That could easily be the monthly metropolitan market (akora) sales of barley. However, line 2 refers to Amnisos, which is the international harbour of Knossos, and the major hub of all international trade and commerce between Knossos and the rest of the Mycenaean Empire, and between Knossos and the rest of the then-known maritime world, i.e. all empires, nations and city states surrounding at least the mid-Eastern & South Mediterranean, especially Egypt, Knossos’s most wealthy, hence, primary trading partner. So in the case of Amnisos (line 2), the independent variable in the nominative is much more likely to be the average monthly figure for international trade in or for barley-by-month. As for Phaistos, it is probably a toss-up, although I prefer international trade. (c) Hundreds of Units of Barley or is it Wheat? But how many Hundreds? (c.1) Before we go any further, it is best to clear one thing up. While line item 1 on this tablet refers specifically to barley, and not to wheat, I find it really peculiar that, in the first place, the ideogram used in line 1 (Knossos) is the ideogram for wheat and not for barley. This appears to be a contradiction in terms. The only explanations I can come up with are that (a) the scribe used the ideogram for wheat in line item 1, because he used it in both line items 2 & 3 (for Amnisos and Phaistos), where he actually did intend to reference wheat specifically, and not barley, or (b) the other way around, that he meant to reference barley in all 3 line items, but did not bother to repeat the phrase kiritiwetiyai = “for barley-by-month”, because (as he perceived it) he did not have to. Wasn’t it obvious to all concerned, himself and his fellow scribes, and their overseers, the palace administration, that is exactly what he meant? Of course it was. But which alternative was obvious (a) or (b)? We shall never know. (c.2) Since the right hand side of this tablet is sharply truncated immediately after the appearance of the numeric syllabogram for 100, we are left high and dry as to the value of the total number of units for each of lines 1 to 3. The number must be somewhere between 100 & 999. Ostensibly, it cannot possibly be the same for Knossos, Amnisos & Phaistos. 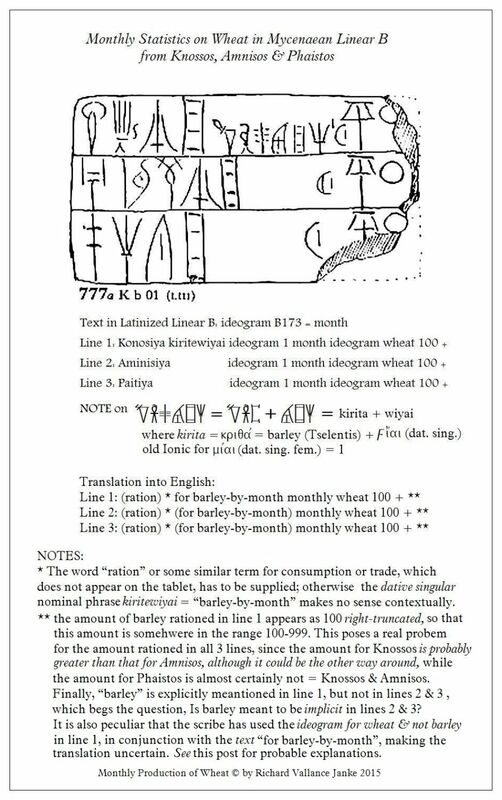 The problem compounds itself if we are referring to sales or consumption of barley at Knossos versus international trade for Amnisos and Phaistos or, for that matter, any combination or permutation of any of these formulae for each of these line items in the inventory. This being the case, there is obviously no point wasting our breath trying to figure out which is which (consumption, sales or international trade) because it will get us nowhere. One thing is certain, however. The scribes themselves knew perfectly well what the figures in each of lines 1 to 3 referred to. We are the ones who are the poorer, not the wiser. (d) You will have noticed that, whatever the semantic value of the implicit nominative independent variable is in lines 1 & 2, which reference Knossos and Amnisos respectively, I mentioned on the illustration of the tablet above that the line item figure for Amnisos could either be lower than or higher than that for Knossos. And that is a correct observation. Assuming that the figure for Knossos probably refers to either average monthly consumption or metropolitan market sales of barley in the city itself, with a population estimated at some 55,000 at its height, the average monthly figure for consumption or sales alone would probably have been quite high, ranging well into the multiple hundreds. But how high? I wouldn’t dare hazard a guess. Likewise, the average monthly volume in international trade of barley (let alone wheat and all other major commodities such as wool, olive oil, spices, crafts and fine Minoan/Mycenaean jewelry) would have been very significant, probably at least as great if not greater than the the average monthly figure for consumption or sales of barley, wheat etc. etc. in the city market (akora) of Knossos. Regardless, the monthly figures for Amnisos and Knossos almost certainly do not reference the same economic activity, so we are comparing apples with oranges. As for Amnisos and Phaistos, the average monthly figures are more likely to reference the same economic phenomenon, namely, international trade. If this is the case, the monthly figures would have been far greater for Amnisos, the primary port of the entire Mycenaean Empire, for international commerce and trade, than for Phaistos, which was an important centre for commerce, but certainly not the hub. However, once again, we have no idea of the average ratio for monthly international trade and commerce between Amnisos and Phaistos, although I surmise it was probably in the order of at least 4:1. 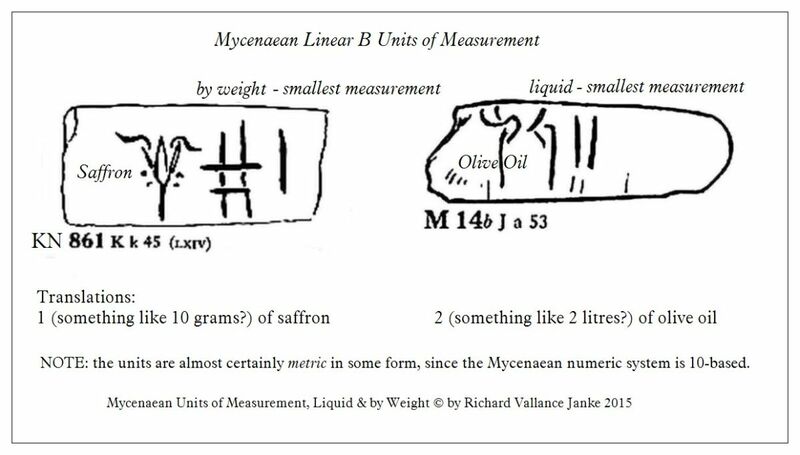 Upon close examination of the syllabogram WE in the context of dry weight in Mycenaean Linear B, in this particular instance, dry weight of saffron, I have come to the conclusion that the line(s) transversing the syllabogram WE at an approximate angle of 105 - 110 º are actually equivalent to the tens (10 & 20), while the black circles in the upper and lower portions of WE are equivalent to the 100s (100 & 200) in the Linear B numeric system. Once again, the scribes would never had added these lines and circles to the syllabogram, unless they had good reason to. And they surely did. There is a striking resemblance between the approximately horizontal lines to the 10s, and of the black circles to the 100s in that system, as can be seen from the actual placement values for 10s and 100s immediately above the syllabogram WE. As if this is not impressive enough, there is even more to this syllabogram. It is in fact a supersyllabogram. Its meaning is identical to the same SSYL for crops in the agricultural sector, namely; WE is the first syllable of the Mycenaean Linear B word weto, which literally means “the running year”, in other words “the current fiscal year”. This makes perfect sense, since the scribes at Knossos, Phaistos, Mycenae, Pylos, Thebes and other Mycenaean locales only kept records for the current fiscal year, never any longer. 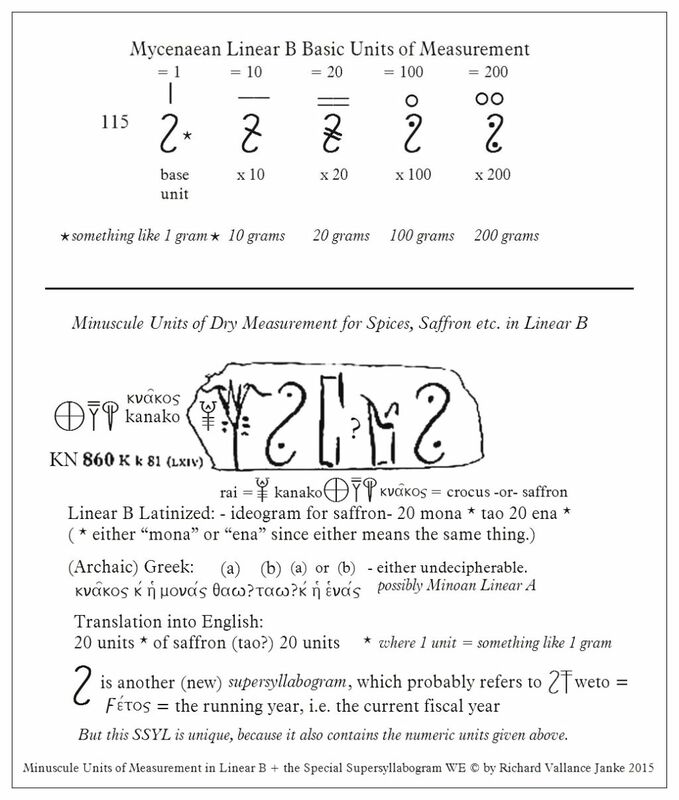 The most astonishing feature of this supersyllabogram is that it combines itself as a SSYL with the Linear B numeric system, meaning that it alone of all the SSYLS refers to both the number of minusucle items (in this case, saffron, but it could just as easily refer to coriander or other spices) and the total production output of the same items for the current fiscal year. The Linear B scribes have truly outdone themselves in this unique application of the supersyllabogram, distilling it down to the most microscopic level of shorthand, thereby eliminating much more running text from the tablet we see here than they ever did from any other tablet, including all of those sporting “regular” supersyllabograms. In this instance alone (on this and the few other tablets on which it appears), this unique “special” SSYL is a supersyllabogram with a specific numeric measurement value at the minuscule level, something entirely new, and seen nowhere else in all of the extant Linear B literature. Quite amazing, if you ask me. NOTE: the assignment of a value approximating 1 gram for the single unit, i.e. the simple syllabogram WE with no traversing lines or black circles, is just that, nothing more than an approximation. I had to correlate the single unit with something we can relate to in the twenty-first century, so I chose the gram as an approximate equivalent. One thing is certain: the unit WE is very small, indicating as it does minuscule dry measurement weight. Aside from the fact that we cannot be at all sure how much each of these units of measurement is supposed to represent, I am still operating on the premise that the Mycenaean system of measurement is 10-based or decimal, hence, something along the lines of the modern metric system. However the units are configured, it is quite certain that in the case of these two tablets, the units must be small, because the items measured, saffron (on the left) and olive oil (on the right) are usually dispensed in small amounts. Since saffron is very light, I assume that the weight is something like 10 grams, while the liquid measurement for the olive oil is in the range of about 2 litres, or whatever amount the Minoans & Mycenaeans used to house these commodities. The translation of this tablet from Knossos into English is relatively straightforward. The problem is that no one really knows what exactly the unit of measure designated by the Linear B symbol that looks like a T means. My best guess is that the 9 shakers of coriander (I say, shakers, because the ideogram looks like a shaker & it is most likely folks used shakers back in the good old days in Knossos, just as we do nowadays). However, the problem remains, how do 9 shakers of coriander add up to only 2 units. My best guess is that the shakers were boxed, 5 units per box. So 9 shakers would have filled one box and most of another... something along those lines. Andras Zeke of the Minoan Language Blog gives a value of approx. 3 kilograms per unit, meaning we would end up with about 5 kg. or so for 9 shakers of coriander. They would have had to be really huge shakers! No one could have held them. So it is quite apparent that the measured value Andras Zeke has assigned to our wee little T is in fact way off the mark, if we are to believe our eyes. On the other hand, that T might very well have been divisible by 10 or even 100, given that the Mycenaean numeric system is based on units of 10, just like our own. So it is conceivable that we are dealing with some kind of metric system here. Given that the Mycenaean numeric is base 10, that would make sense. So we could be dealing with something like 50 grams and not 5 kilograms of coriander... that would make a hell of a lot of sense. But since we were not there to see how the scribes allocated the spice jars into so-called units, we shall never really know. Still, there is no harm in speculating. Now, as for my translation of the ideogram for a spice container (spice shaker), I have translated it specifically as a “a coriander spice shaker”, since on every single every tablet, bar none, from Knossos mentioning spice containers, it is always coriander that is spelled out. The folks at Knossos must have been crazy about coriander! Since there are only 2 or 3 tablets which do not mention coriander outright, that leaves us with around 95 % of all tablets referring to spices which do spell it out. Linear B scribes were very fussy about having to spell out the names of spices, or for that matter, anything on Linear B tablets which could be easily represented, i.e. symbolized by an ideogram. The ideogram appears on this tablet, but the word does not. This is practically beside the point. It appears that the scribe simply did not bother writing it, for some reason or another. The practice of spelling out the name of any item on a Linear B tablet which can easily be illustrated with an ideogram is very unusual. The scribes were sticklers for saving space at all costs on what is admittedly a very small medium, rarely more than 30 cm. wide by 15 cm. deep, and more often than not, even smaller than that! So the fact that the scribes generally did spell out coriander as the spice of choice for Minoan Knossos seems to imply that the king, queen, princes and the palace attendants prized it very highly. Achareus delivers for deposit at Phaistos 9 shakers of coriander for a total of 2 units. Achareus delivers for deposit at the palace of Phaistos 9 shakers of coriander for a total of 2 units. These are all valid translations, since after all everyone who was anyone, meaning the scribes, the nobility and the wealthy businessmen) knew perfectly well that such precious commodities as coriander could only be consumed by the well-to-do, and that these folks all lived – you guessed it – in the palace! There was absolutely no need in the minds of the scribes, meaning, in practice, for them to write out what was obvious to everyone. This is precisely why nowadays we need to learn to read out of the tablets what the scribes were actually inventorying, rather than trying to read into them. If this sounds like a tough slog, you bet it is. But it is far better to aim at getting the actual gist of the message on the tablet (whether or not spelled out in text, or simply with logograms and ideograms) than to strip down your translation to the point where it becomes unintelligible. All of this further implies that, while Linear B, the accounting and inventorying language for Mycenaean Greek, was homogeneous, uniform and formulaic to the teeth, the actual Mycenaean dialect may very well have not been. In fact, I sincerely doubt it was, since it is symptomatic of all ancient Greek dialects, even those which are closely related (such as the Ionic and Attic) to diverge and go their own merry way, regardless of the structure, orthography and grammatical quirks of their closest relatives. Since that was surely the case with every ancient Greek dialect with which we are familiar – and God knows it was! - then it must have also been the case with Mycenaean Greek and with its closest, kissing cousin, Arcado-Cypriot Greek, the latter written in Linear C or in the quirky Arcado-Cypriot alphabet. 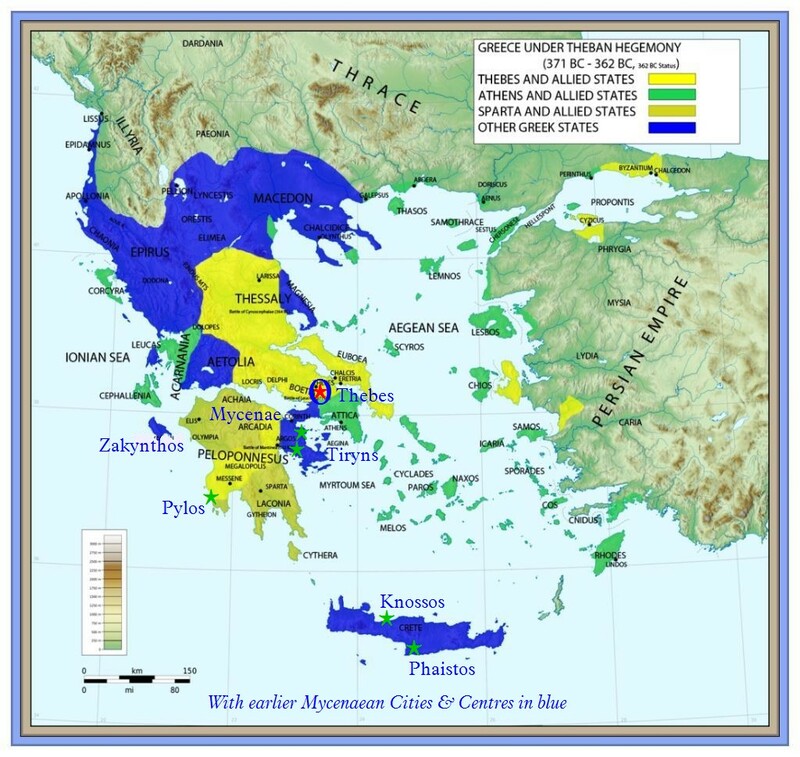 Even though no other ancient Greek dialects were as closely related as were Mycenaean and its kissing cousin, Arcado-Cypriot, these dialects were somewhat different. What is more, it is almost certain that there were notable variations within each of these dialects, the further afield you went. In other words, the Mycenaean Greek spoken at Knossos and Phaistos, which would have been much more influenced by its forbear, the Minoan language, was a little different from that spoken at Pylos, and doubtless even more from the Mycenaean Greek at Mycenae, Tiryns and especially Thebes. But spoken Mycenaean Greek and the Mycenaean Linear B accounting and inventorying language are not the same beast. The latter is a homogeneous, formulaic and largely shorthand subset of the former. I shall have a great deal more to say about this extremely important distinction between the two in future. spring haiku de printemps – when spring isn’t spring = printemps oui ou non ? senryu – excuuuse me! = excuuusez-moi !